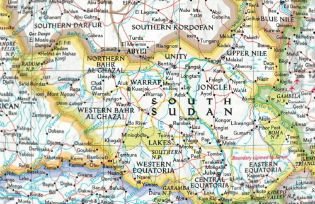 The South Sudanese political landscape has become frighteningly unpredictable. It is nearly impossible to address one crisis without another more serious one cropping up. The political risks were low while the economy boomed, but became high once it began to crash under the weight of a trinity of shocks to the polity: South Sudan’s suicidal decision to shutdown its oil production over a row with neighboring Sudan in 2012, global crumbling of crude oil prices, and the civil war that broke out in December 2013. The signs of a conflict erupting and the build-up of tensions, marked by a sequence of revenge killings, were visible to the coalition government in Juba during the first week of July 2016, yet the government was unable to prevent them. Some analysts have said this failure is due to a lack of command and control from top leadership. However, the best way to explain this failure is by exposing how fraudulent an enterprise the government has become, selling false promises and propagating fear. Self-preservation and remaining in a warmongering mindset are top priorities. Tribalism is key to this success but profoundly damaging. For the opposition, fighting for equitable representation in the elite club is a key motivator in the conflict. But the rebel leadership, like the government, also propagates fear to mobilize fighters. Peace accords only benefit members of this elite club. Power-sharing peace accords that have been signed by warring parties only last as long as there is enough money in the public treasury. Once the country’s resource envelope has been exhausted, the elite club begins to disintegrate, sending its members to embark on mobilizing innocent crowds to fight either for those elbowed out – to regain their membership – or to maintain the positions of those who are already in the club and feel threatened. Innocent people end up fighting for the interests of this elite club, and the international community labors to deal with these elite-centric pacts in accordance with resource realities. These government agents with access to resources and the ability to decide how they are allocated form this minority club of elites. They are undoubtedly dominated by members of the Dinka ethnic group. This cycle has many effects on community relations. One of the particular dangers is the demonization of the Dinka collectively because of the behavior of a handful of their leaders. It is the same conclusion a non-Dinka priest has reached. While driving to church, he stopped at the Mobil roundabout in Juba. A woman and two children approached his car asking for help. The priest rolled down his window and chatted a little with each of them and gave them a little something. While preaching, the non-Dinka priest told his congregation that some had been under the impression that the government was beneficial to the Dinka and oppressive to non-Dinka, but the majority of people begging on the streets of Juba were Dinka. He concluded that the government had oppressed all vulnerable citizens, regardless of their tribes. While a good number of Dinka are suffering the humiliation of having been reduced to beggars as a consequence of inadequate political and economic policies, a good number of them are nevertheless still supportive of the leadership. Culturally, a Dinka man would die protecting neighbors’ cows from outside raiders, but the logic is implicitly utilitarian: the man could potentially receive the cows as a bride price for his daughter or sister or female relative. This was the way in which a Dinka man could speak of ‘our cattle camp’ even if he himself had not a single cow. ‘Our government’ simply doesn’t exist, given the way most governments in Africa tend to be nothing more than extractive entities benefiting only the minority that negotiates the sharing of resources among its members. Interestingly, while the elders agreed that such a chief should resign immediately, as he had lost the trust and legitimacy to continue ruling over his people, they could not pass the same judgment on their fellow Dinka – the President of South Sudan. What is at the root of the fear? Some powerful actors have their own leadership ambitions which they feel can only be achieved by stirring up violent crises, so as to shake up the system and eliminate political rivals. For instance, a group of political elite from the Dinka emerged under the name of Jieng Council of Elders. They used fear to manipulate the president and radicalize a host of young Dinka men who had been recruited to wage a propaganda war. The hatred is sold to the president as a sign of love for him. But at the root of it, the propagation of fear is a tool for settling internal competition among the political and military elite of Dinka. The difference between President Salva Kiir and the Jieng Council of Elders, who purportedly support him, is that the president would rather share power with his archrivals than with those who harm him so as not to lose his position at the apex. The hardliners, however, are willing to continue pushing for war to get rid of the opposition even if this would mean the president losing power or the fate of the country being decided by external powers, as it seems to be now. Fear limits the options of the suffering masses who are categorized into their ethnic cells. They are presented with hard choices: either you support the leadership on a tribal basis or face extermination once the other side wins the contest for power. The state is already bankrupt and thereby unable to deliver services and can only rely on tactics of self-preservation, using fear to forcefully drive the masses to support its agenda. While there is sufficient external pressure urging the principal actors to do the right thing, there is nearly zero internal pressure urging them to correct themselves. The few voices that weren’t scared into silence have been physically threatened and thrown into jail. A deep-seated fear drives the remaining vast majority to fight to secure or maintain slots for their sons in the elite club despite the fact that they do not reap any benefits. The elite packages this rivalry as beneficial for the wider group, however, it only serves their own interests of self-preservation with complete disregard for the well-being of people. Daniel Akech Thiong is a South Sudanese independent researcher.